Great atmosphere, freedom to explore, and co-op for a deep campaign. Even three years after the launch of VR, so many game demos I play start the same way: I have a sword and shield (or gun), and a tutorial teaches me how to block incoming attacks or pick up objects by reaching out with my hand. It's rudimentary VR immersion, and I'm pretty bored of setpieces that lock me in place while enemies slowly fly towards me. The first thing I did was stare into a working mirror, watching my Johnny-5-but-tall robot avatar move its arms and tilt its head as I tilted mine. A few minutes later, I ripped off my left arm and replaced it with a new one that could fire laser beams. It's a much cooler arm. 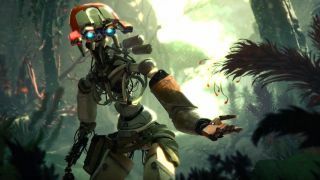 Last fall I played a combat-focused demo of Stormland and wrote that it "is exactly what I want from a VR game: Cool enough that I'd want to play it even without an Oculus headset, but much better because it's built to take full advantage of being in VR." There's a sense of physicality in Stormland that most VR games strive for but don't quite reach. Playing Stormland again, back-to-back with a few other VR games, it's striking just how confident and sophisticated it feels in comparison. It's hard to convey why, exactly: I get the sense that this game respects my ability to learn by experience, rather than hand-holding me through every basic step. There are so many clever little touches. To pull up my mission objectives, I rotate my hand so my palm faces upwards, and a hologram menu pops up. A tiny 3D hologram of a map also hovers over my hand, and it's honestly a little hard to make out in detail on the VR headset's screen, but I love the idea so much I almost don't even care. That's the kind of functionality I want out of a robot hand! The chunk of Stormland I played this time is patient in introducing its story and world, and in half an hour I'd barely done any combat. I wasn't bored: It teases out what's happened to the islands' now-missing or destroyed robot caretakers with flashbacks and environmental details that make me want to know the backstory. Who is the robot I keep getting glimpses of from my corrupted memory cells? What happened to the bots now overgrown with plants and vines? Why are all these facilities out here in the stormland, anyway? Pretty soon I'm scaling 50 foot walls with the magnetic pads embedded in my hands, and a few minutes later learning I can use momentum to fling myself sideways onto a nearby ledge for a breather. From my previous demo I know verticality plays a huge part in combat, but it feels dramatic and adventurous in this moment of exploration, being able to scale these giant facilities and find my own way up. It strikes that ideal videogame balance of being guided but feeling freeform and natural, the way good environmental design usually does. There's a sense of physicality in Stormland that most VR games strive for but don't quite reach. Plenty of VR games let you block attacks with a shield or reach out and press buttons or pull levers, but Stormland extends that logic to physical objects. If you want to break a gun down for scrap parts that you'll be able to use to craft other weapons and upgrades, you put your two hands together, hold down the trigger and pull apart, literally ripping it to pieces. When you grab a machine pistol with two hands the barrel elongates and it transforms into an assault rifle, a perfect little sci-fi moment. I stopped my demo just short of a big combat section, but I'd played enough of Stormland's combat before to know that moving and shooting felt good. Its large arenas offer some flexibility in how you approach a fight, either hiding and popping out for a few shots, or aggressively taking the high ground by climbing up a wall and sniping at everything in sight. After playing I briefly talked with designer Mike Daly, who confirmed that the aspects of Stormland I'm most excited about—which I haven't even mentioned here yet—are indeed still coming to the game. It supports co-op, and not just in a throwaway horde mode or something. You can play the campaign in co-op, and many of Stormland's combat encounters are based around being able to scout out enemy locations and plan your approach before engaging. I'm ready to be a robot hunter crouched in the underbrush, counting out a 3-2-1-go before attacking in unison. It's an open world, but built out of bite-sized islands that I think are better suited to half-hour bursts of VR activity. There's also a degree of procedural generation of Stormland's collection of islands, mixing and moving parts of the environment over time, which is meant to keep players coming back. After playing through the intro and getting a taste of Stormland's story and presentation, I thought those multiplayer and open world elements may have been abandoned for a more focused narrative experience because what I played solo was just done so well, and so confidently. But those multiplayer features are still very much still part of the plan. From what I've seen, I think everything will click in place as well as a new robot arm. If there's a better game coming to VR in 2019, I'll be surprised.